From the #1 New York Times bestselling author of Beartown and A Man Called Ove, hailed as “a writer of astonishing depth [with] the remarkable ability to make you understand the feelings of each of a dozen different characters” (The Washington Times), a heart-wrenching story of how loyalty, friendship, and love carry a town through its darkest days. After everything that the citizens of Beartown have gone through, they are struck yet another blow when they hear that their beloved local hockey team will soon be disbanded. What makes it worse is the obvious satisfaction that all the former Beartown players, who now play for a rival team in Hed, take in that fact. Amidst the mounting tension between the two rivals, a surprising newcomer is handpicked to be Beartown’s new hockey coach. Us Against You is a declaration of love for all the big and small, bright and dark stories that form and color our communities. 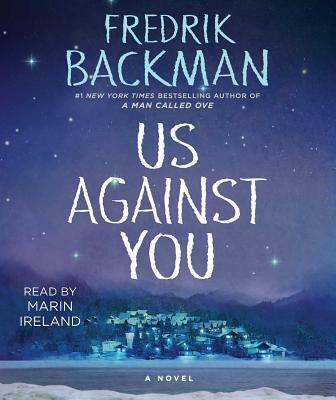 Compelling and heartbreaking, it’s a roller-coaster ride of emotions and a showcase for “Fredrik Backman’s pitch-perfect dialogue and unparalleled understanding of human nature” (Shelf Awareness). Fredrik Backman is the #1 New York Times bestselling author of A Man Called Ove (soon to be a major motion picture starring Tom Hanks), My Grandmother Asked Me to Tell You She’s Sorry, Britt-Marie Was Here, Beartown, Us Against You, as well as two novellas, And Every Morning the Way Home Gets Longer and Longer and The Deal of a Lifetime. His books are published in more than forty countries. He lives in Stockholm, Sweden, with his wife and two children. Connect with him on Twitter @BackmanLand or on Instagram @backmansk.